Its archival print is available in JooJoo shop. Aww so sweet! and a great quote! I can always count on your illustrations for a smile. This is so awesome. Love the patterns in this one! Dearest sweet afi, this is beautiful and such a wonderful reminder to a lovely sentiment. Have a lovely merry happy day and love to you! Great quote, your art is so colorful! Love it! Oh, SO CUTE!I think you should always have your invisible crown on, even if you sleep! (It does not hurt, of course!) Love it! Love the details! And your right, it's perfect for this week's subject. I have to keep this quote in mind!! Love the quote and the illustration is just so adorable! I love the patterns on the bird's chest. Too cute! Btw, you are AMAZING with watercolors - almost makes me think I could try it again (was never very good at it, hehe). What a pretty little bird! love this piece oh so much but not only that; just so happy to have found you! Love your blog! Everything in here, love your style, your bird-love and love that we have something else in common too; talented sisters that we seem to be so so close with! Will be following you with pleasure : ) Great! Thanks for the smile. You are so talented! Ooooooooooooooh, YESSSSSSSSS! I just LOVE this! It's perfect in every way. You are so talented in anything you do! Many thanks for your kind comments friends :) You're so wonderful! That's clever. I like that one. 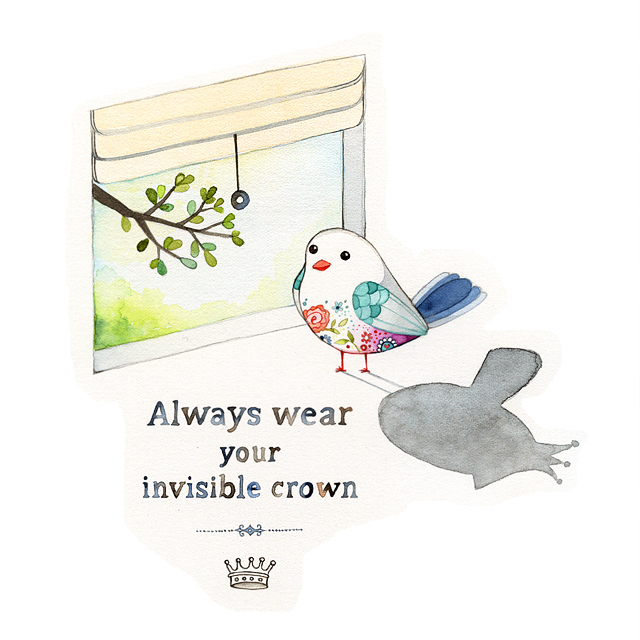 It's easy to forget the crown when it's invisible, though. I fell down the Blogger rabbit hole and eventually ended up here. Glad I did.